My urge to paint started at a very young age, even before I attended school in the town of Danubyu where I was born. I remember I often made sketches and tried to draw pictures from magazines in my childhood. My chance in learning to draw was from my village school but the influence of my uncle and two of my brothers, who are good hobby artists, made deep impressions on me and set my mind burning to becoming an artist when I grow up. Born and brought up in a farming region, my hometown Danubyu has always been surrounded by fields of sunflowers and rice cultivation and has changed little. The natural beauty, the farms, the hardworking farmers and their animals have had a great impact on me ever since. 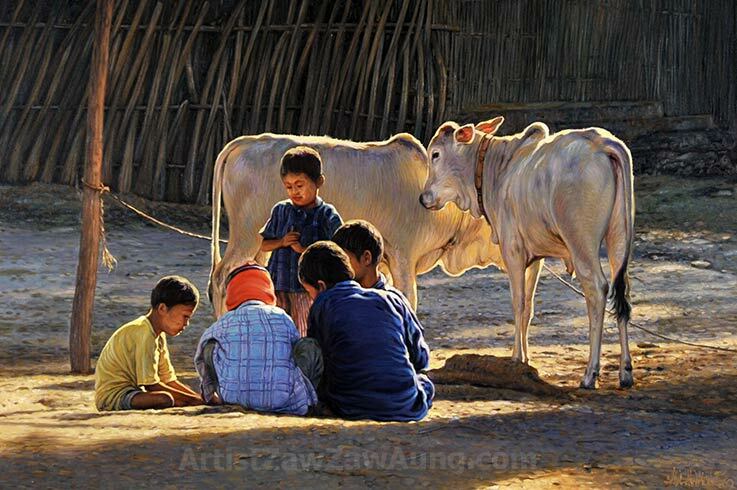 Today, many of my paintings often portray figures of poor farmers, their lives and their animals. I became greatly interested in fine art and after my high school education. I proceeded to study at the School of Fine Art in Yangon. After three years of formal art education, I continued to receive valuable guidance from Artist Min Wae Aung who also acted as my mentor. The opportunity of working in the studio and with Min Wae Aung built up confidence in me and prepared the groundwork for my career as an artist. 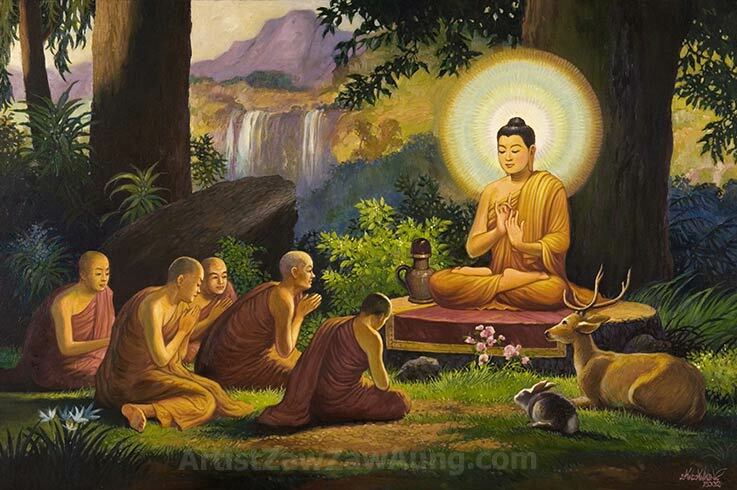 I was inspired by his works and I greatly admire the works of old Myanmar art masters like U Ba Nyan, U Ngwe Gaing and U Ba Kyi who made Burmese traditional paintings famous. Western artists like Andrew Wyeth and Norman Rockwell gave me a lift in appreciating painting from a western perspective. I consider myself fortunate to have the support of my parents and family who gave encouragement by allowing me to pursue my love and develop my hobby of painting into a career as a professional artist. I find fulfillment and happiness in my work as I am able to earn and support my wife and two children through my love in painting. 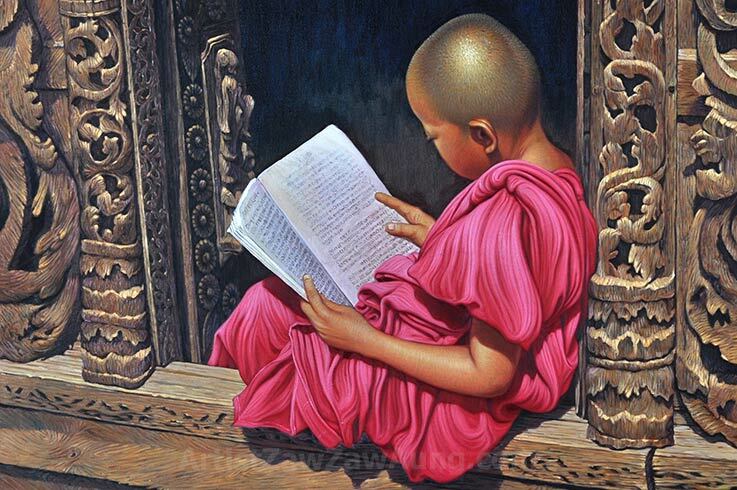 My goal is to promote the arts and rich culture of Myanmar through the medium of my paintings to people of all nations. I hope to achieve this object through my “Living Canvas”. Through the medium of Arts may people of all races find peace and harmony and the beauty of nature in their lives.